This is the most commonly adopted standard. 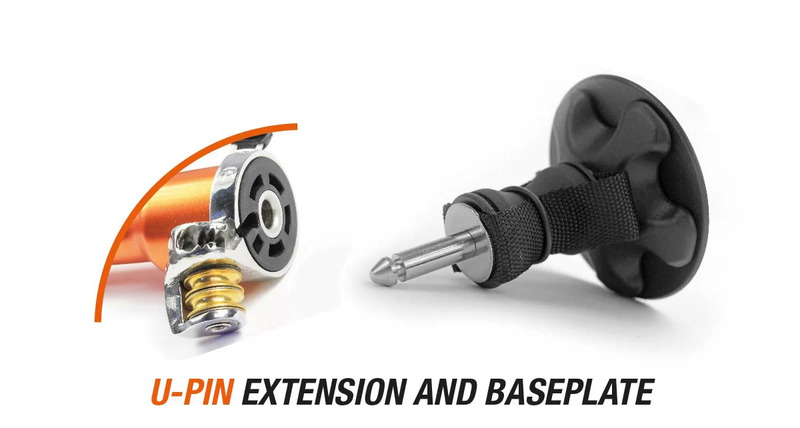 An advantage of U-Pin is that the compatible mast extensions are equipped with a push button or trigger mechanism to connect and release in the most ergonomic way. Also referred to as US Push-pin, or US-Cup. This system is widely used in America. Two push-pin buttons need to be pushed in simultaneously to disconnect the mast extension from the baseplate. This is a very robust system, but it is less ergonomic to operate, and has more play between baseplate and mast extension when connected. You also need to know which of the two available mast diameters you'll be using your mast extension with. There are two type of masts: RDM - Reduced Diameter Mast, and SDM - Standard Diameter Mast. Also consider how many pulleys the extension is equipped with. 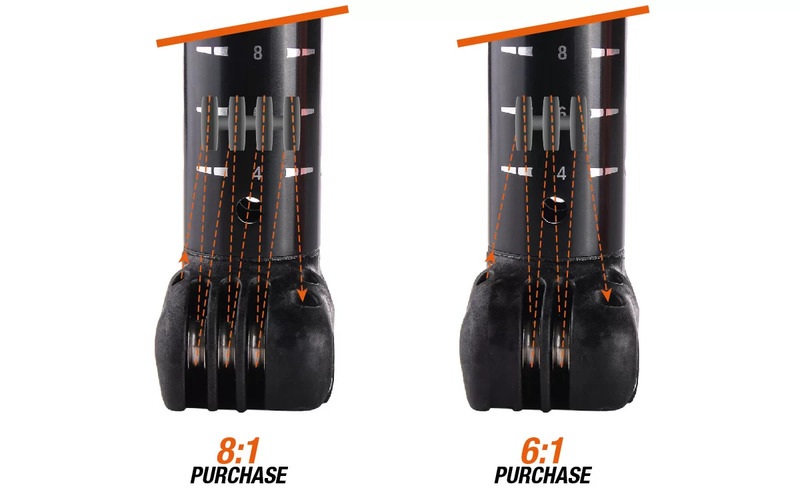 There are two types of pulley configurations available for mast extensions: 3-pulley (offering maximum 6:1 purchase) and 4-pulley (offering maximum 8:1 purchase). The 3-pulley mast extension configuration is the most common, and for most sails is ideal. The 4-pulley mast extension configuration is mostly used with race sails that require very high downhaul tensions. The greater mechanical advantage of the 4-pulley configuration means that less effort is required to achieve the necessary downhaul setting, and fine-tuning is more precise. The most noticeable difference between carbon and aluminium extensions is weight. 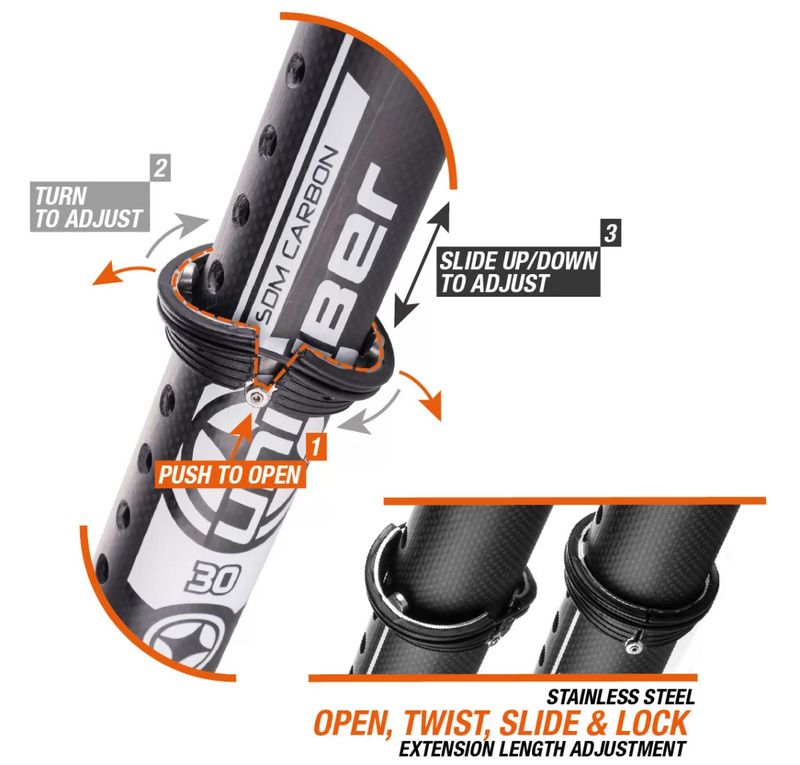 Multiple small gains through weight reduction of rig components has a cumulative effect, resulting in improved overall responsiveness and crisper sensations, allowing you to sail faster with less fatigue. Of course, if you are only swapping an aluminium mast extension for a carbon one, that alone will not make a big difference. It is the combined weight reduction that matters: board, mast, boom, extension, footstraps... all parts! 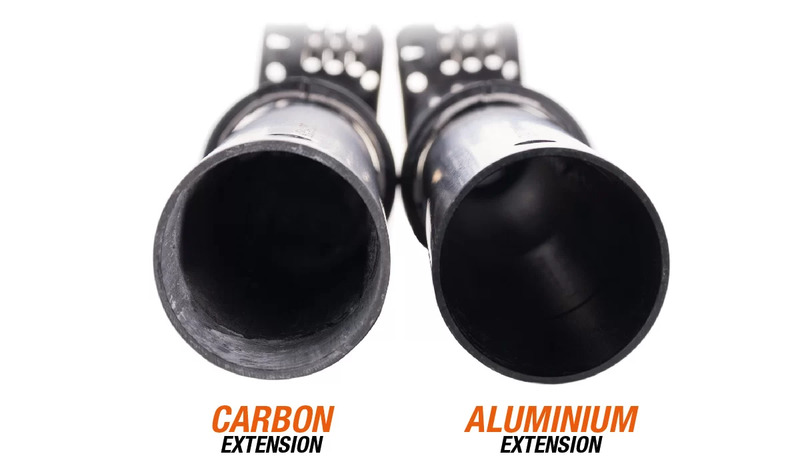 Budget-wise, carbon mast extensions are 2-3 times more expensive than aluminium. From a resilience / safety point of view, aluminium is a better choice than carbon. Nothing is unbreakable (unfortunately!) but when an aluminium extension is stressed to failure it will typically bend - meaning that sailing back to shore should be possible and safe. In contrast, when a carbon extension fails, it will typically snap into two pieces - making normal sailing impossible, and potentially leaving you in a compromised situation. 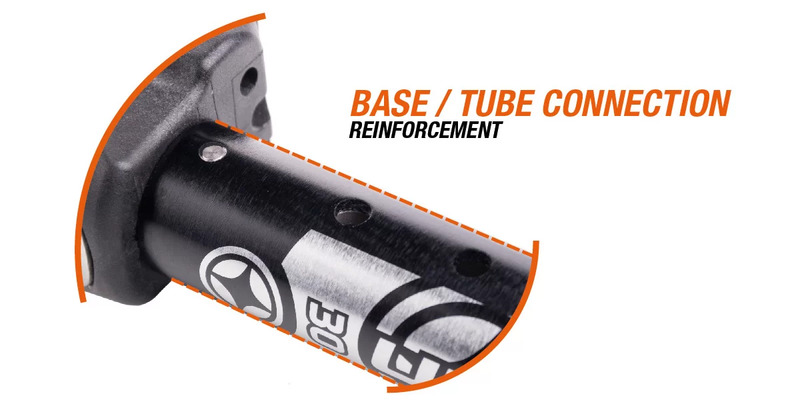 Mast extension tube wall thickness is the major determinant of resistance to deformation bending and/or breakage. RDM extensions have thicker walls than their SDM equivalents. This is because smaller diameter tubes are inherently less rigid than larger diameter tubes, so need thicker-walled tubing to compensate. The extra material present in the thicker walls also makes them heavier than their SDM equivalents. A less critical, but still important component to consider, is the collar adjustment mechanism. This part lets you set the mast extension at the correct length. Here we explain the difference among various options available. This is the most widely used method, being simple and reliable. Just insert the pin at whatever setting is needed then slide the collar down to lock the pin securely in place. A drawback of this solution is that when the mast extension is not in operation the collar is free to slide and could be lost. To prevent this happening, some extensions use a plastic end-cap with a flexible 'catch' to prevent the collar sliding off the tube. 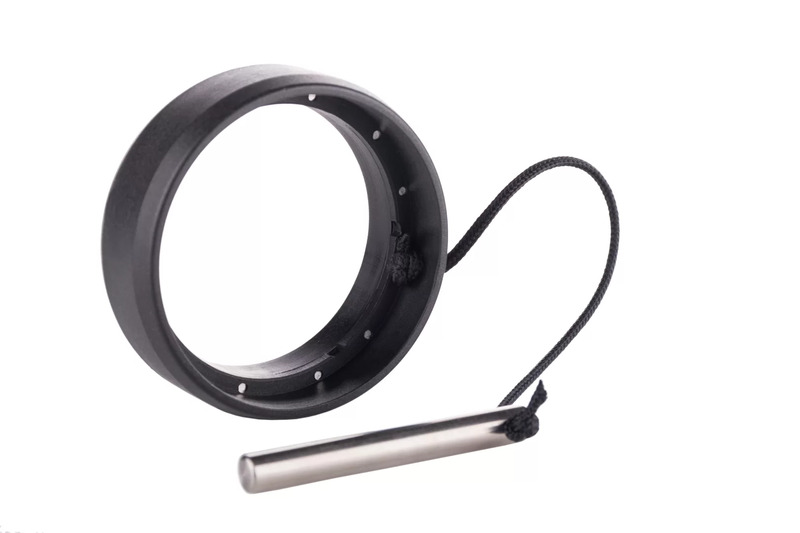 A stainless steel reinforced Ring & Pin has exactly the same features as Ring & Pin, but has additional stainless steel reinforcement to prevent the pin getting pushed into the plastic collar. It better resists high downhaul loads. 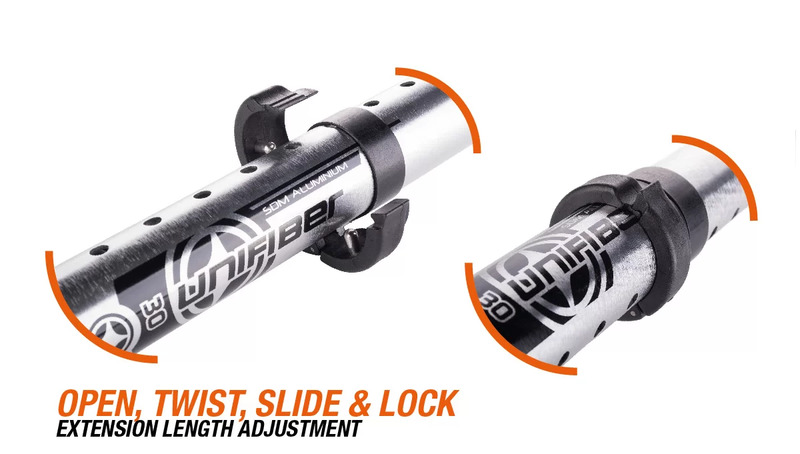 The 'Open, Twist, Slide & Lock' option is the easiest to operate with just one hand. A minor disadvantage to be aware of is that, if incorrectly closed and used under tension, the hinge part can catch the sail's luff sleeve and/or sustain deformation damage. However, with normal care this can easily be avoided. The stainless steel version of the 'Open, Twist, Slide & Lock' uses stainless steel to reduce deformation and enhance durability of the collar. The greater the pulley diameter the easier it will be to apply downhaul. 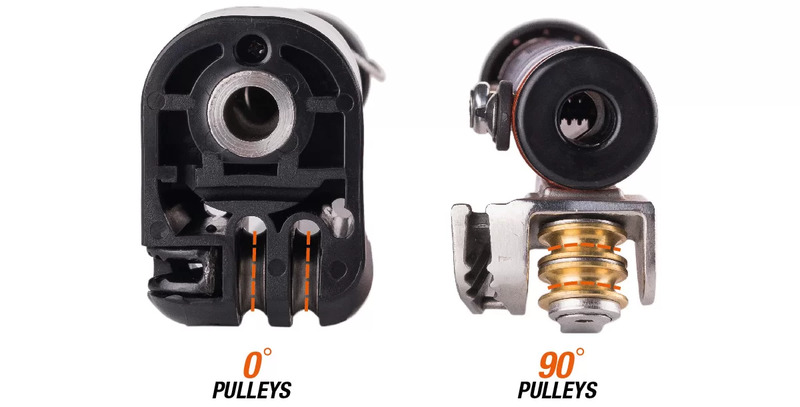 There are two types of sail pulley orientation setup: zero degrees is considered regular (black extension in above image); ninety degrees (orange extension) is considered perpendicular to the mast. Threading the downhaul ropes so as to avoid crossing the lines will reduce friction and makes it easier to apply and adjust downhaul. With correctly threaded line you'll be able to downhaul your sail pulley-block to extension-block. With crossed line achieving sufficient downhaul is difficult (at best!). Although with most extension/sail combinations it is possible to thread the rope without crossing - in general it is quicker, easier and more intuitive if the extension is matched to the sail's pulley orientation. Some extensions are designed to accommodate sails with either orientation of sail pulley-block. To achieve the required rig tension, many sails need between 200kg and 450kg of downhaul force. So another important detail you should consider when buying a mast extension is the quality, and length supplied, of downhaul rope. Good quality rope will last much longer; and lower friction will make downhauling the sail easier. Downhaul rope should be sufficiently long to allow correct threading through the pulleys and out beyond the cleat of the mast extension. If it is too short it will be difficult to thread the rope without it slipping through your hands; or there may be insufficient rope beyond the cleat to get a good grip on. Remember to allow for a longer rope run if using a 4-pulley mast extension. Most extensions are equipped with a standard quality of 4.0mm polyester rope. Polyester rope functions reasonably for a majority of users. Pre-stretched polyester rope is less elastic than standard polyester rope. Less elasticity makes for easier downhauling. Pre-stretched polyester rope is usually 2-3 times the price of normal polyester rope. Dyneema® is the strongest, lightest and toughest rope quality available, making it the best choice for any mast extension. Dyneema® has less friction then polyester or pre-stretched ropes, and a much higher tensile strength. The only downside to Dyneema® is that the price is usually 3-5 times that of polyester rope. This is the part of the mast extension base receiving the U-pin. Most mast extension base parts are produced from Nylon (plastic), which over time does show wear. When made from stainless steel the wear between the U-pin and mast extension base is considerably less, helping to maintain a solid board / rig connection. At the expense of considerably higher weight, a stainless steel pulley block guarantees simplicity and strength. This part is typically full stainless steel molded and houses the extension's pulleys. To prevent flex between the mast extension base and tube, additional reinforced stainless steel or aluminium supports are added. A push button is the most common way of securing the U-Pin. The button is connected to a metal plate. Internally, button/plate are pushed by a spring into a notch on the baseplate U-pin. Externally, pushing the release button slides the plate out of the notch. 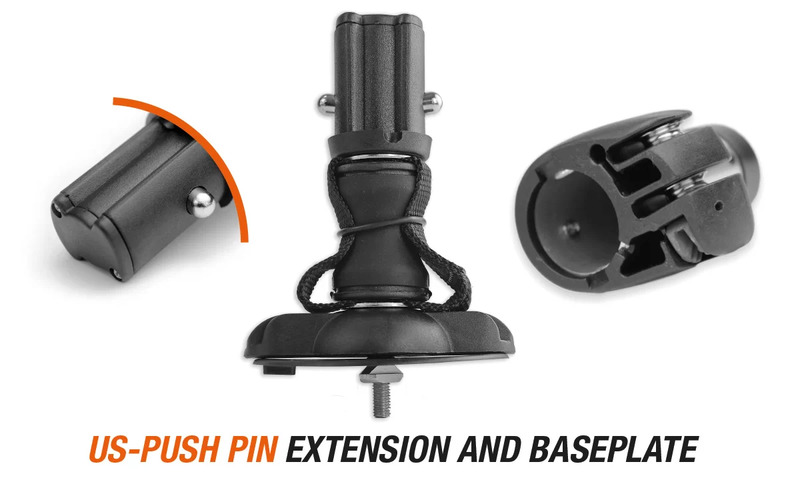 This exclusive Unifiber Elite Extension way of securing a U-Pin mast extension onto the baseplate has the same principle as a push button, with the major difference being that a 2-pin, fork-shaped part secures the U-pin from one side to the other, reducing unwanted disconnections to an absolute minimum. An advantage of this mechanism is that - compared to the push button system - it is less likely to become jammed with sand and salt. Most cambered induced sails are equipped with a tack strap making it possible to add shape to the foot panel of the sail, adding more power below the boom. But if the tack strap slips up the extension then it loses tension. Very few mast extensions are equipped with a tack strap edge to prevent the tack strap from moving up.